I am touched and flattered to receive so many letters from fans around the world. 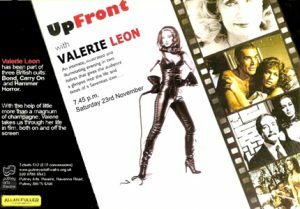 My activities include Films, Television, Guest Appearances, travelling and performing my one woman show ‘Up Front with Valerie Leon’. I appeared in two short films, Gas which is based on an early Hitchcock story and A Neutral Corner a 13 minute surreal and dreamlike insight into the subconscious of a comatose boxer . Both these films were directed by promising young female directors, Sylvie Bolioli and Emily Greenwood. These films were presented in a number of international short film festivals with great success. I was delighted to see that in one festival both were competing against each other for the top prize! A Neutral Corner, has so far received 17 official selections and was the winner of the prestigious Best Short Film award in the Kodak Short Film Competition. I enjoy making guest appearances at film conventions in the UK and abroad (most recently Los Angeles). When I got my illustrated talk about my career off the ground, it was premiered in Spain in Almeria (where so many of the Spaghetti Westerns were made!). British venues so far include Gravetye Manor in West Sussex, The Maltings Arts Theatre in St Albans Hertfordshire, The Jermyn Street Theatre, and Central Hall, Westminster, Putney Arts Theatre and most recently Leicester Square Theatre. Talking about my career has given me as much pleasure as it appears to have given members of the audience. I am touched to see fans arriving from all over the country to support me and really enjoyed meeting them after the shows. This new departure in my career also gives me a great opportunity to visit new places. 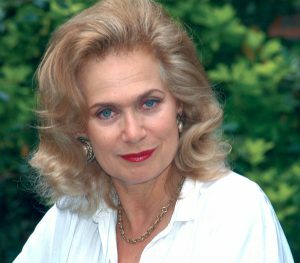 ‘….Valerie gave us an insight into her long and varied career …and we realised why she still tops the bill as one of UK’s most glamorous and articulate thespians’ – Encore Magazine. Purchase Signed Photographs and Merchandise.